Congratulations to Aaron on being appointed as a Distinguished Speaker for the Association for Computing Machinery (ACM). The esteemed Distinguished Speaker Program brings together international thought leaders from academia, industry, and government to give presentations to ACM chapters, members, and the greater IT community in a variety of venues and formats. The outreach program coordinates speaker lectures to consider the most important challenges in computing today and facilitates professional networking. Professor Quigley is Chair of Human Computer Interaction in the School of Computer Science at the University of St Andrews. 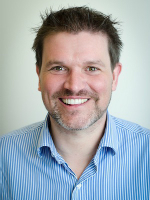 His research interests include surface and multi-display computing, body worn interaction, human computer interaction, pervasive and ubiquitous computing and information visualisation.